Football - Hebden Royd Red Star v Shelf United. Chad Godfrey for Red Star and Jonathan Farrell for Shelf. Hebden Royd Red Star beat Shelf United 8-6 after extra time in an astonishing Halifax AFL Challenge Cup game last Saturday. Red Star looked booked for an early exit when they trailed 4-1 midway through the second half at home to their Premier Division rivals. They made their customary slow start and were 2-0 down before Tom Barclay’s goal got them up and running. However, Shelf scored twice more and will feel they should have been 5-1 ahead at the break with Billy Grogan shooting wide from the penalty spot. Home player-manager Chris Garbutt, playing up front in the absence of injured Lewis Cockroft, netted the home side’s second mid-way through the second half. Dan Lumb came off the bench to give the comeback more momentum and Mark Bradbury’s header from a corner with five minutes left made it 4-4. Chad Godfrey nosed Star in front for the first time in extra time but Shelf immediately grabbed two goals, Harry Talbot finishing with a hat-trick. Godfrey made it 6-6 and Barclay’s long shot which took a deflection and looped over the ‘keeper put Star 7-6 up. Garbutt then broke away to chip the ‘keeper and seal victory. A terrific cup tie at Sowerby United ended 3-3 after extra time with Northowram going through 5-4 on penalties. Both sides started brightly but it was the Rams who scored first when a well worked corner ended with Mark Eade scoring. Sowerby hit early in the second half when Ben Hiley got free in the box to score with a powerful header. 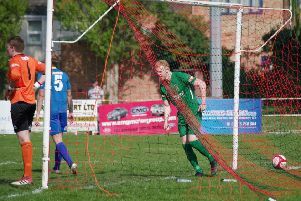 Sowerby took the lead when the impressive James Clegg was bundled over in the box and Dan Crossland scored the penalty. Just as it look like Sowerby had done enough Karl Amos got the Rams level. Amos then put his side ahead again before Dan Boyd struck to draw Sowerby level. The game went from end to end but neither side could make the breakthrough and the game went to penalties. Sowerby missed their fifth kick before the Rams converted theirs to seal the win. AFC Crossleys were good value for a 5-1 home win over St Columbas. Benny Bower and Andy Mellard put them two up but Scott Holmes replied before Craig Gladwin’s 25-yarder into the top corner made it 3-1 at the break. Nathan Sloane put more daylight between the teams and then added a penalty after he had been fouled. Saints fired a penalty over the bar but they were clear second best to Kev Crossley’s side, awho were well served by Mellard, Brendan Fitzpatrick and Dave Mlodeski. Greetland finally kick started their season with a fine 2-0 home win against a very good and well organised Calder side. The visitors edged the opening 15 minutes with Craig Taylor twice denying Calder’s frontline with a couple of point blank saves. The much-changed hosts settled with Tom Wall and Charlie Cliffe at the centre of their side’s attacking play. Wall’s through ball cut the Calder defence but Niall Carrington’s goal-bound shot was deflected over. Aaron Dorward was a constant threat and had a shot cleared off the line. On the stroke of half time Wall’s corner was deflected in after a goalmouth scramble. Carrington, Danny Dorward and Danny Hutchinson all went close while Calder’s Ricky Topham created a couple of chances for himself, but fine defending from Dave Walker and Mickey Conroy kept him at bay. Victory was sealed with 10 minutes to go when the tireless Aaron Dorward burst through and was brought down in the box, but still squared for Carrington to coolly side-foot home. Ryburn United were given a thorough examination by visitors Mixenden United, coming through 2-1. All the goals came in the last 20 minutes with defences generally on top, centre backs Oliver Brierley (Ryburn) and Paul Kemp (Mixenden) shining in a game well refereed by Andrew Gee. Macauley Peacock and Ashton Richardson eventually gave Ryburn a 2-0 lead but substitute Chris Woodhouse came on to score with a superb shot to ensure the home side could never rest on their laurels. Jordan Bedford’s hat-trick gave Sowerby Bridge a 3-1 win over division-higher Holmfield, for whom Jordan Pettifor got the goal. Copley United won 4-1 away to Halifax Irish Centre with two goals from ace marksman Gary Ash. Salem Reserves won their first knockout tie for 16 years when winning 6-2 away to Shelf United Reserves in the first round of the Invitation Cup. Salem had beaten their opponents handsomely on Savile Park a week earlier in the league but five of their successful side were missing for the rematch. Shelf made the running up the slope but were thwarted by an off side trap marshalled superbly by skipper Richard Boyle and a couple of smart saves from ‘keeper Kyle Hogan. Salem took the lead against the run of play when Scott Fieldhouse prodded home after a goalmouth scramble. The Shelf full back volleyed into his own net, Luke Heggerty’s cross floated over ‘keeper Derek Amos and Salem had barely finished celebrating when Fieldhouse chased down a hopeful punt to put the visitors four up at the break. Shelf got one back when Hogan miscontrolled a simple back pass and a Shelf player nipped in only to be brought down. Hogan saw red and Robert Smith drilled home the penalty. When Ashley Drake got a second with 25 minutes to go it was game on. However Ricky Beaumont scored with a looping header and Dave Holcroft beat the fullback before crossing for Fieldhouse to complete his hat-trick. Fieldhouse blazed a penalty over the bar in a game superbly controlled by young referee Danielle Whitworth. Northowram Reserves beat Illingworth St Mary’s Reserves 4-2 on penalties after a close-fought 3-3 draw. Illingworth had grabbed the lead when Nathan Madin slid in from the right. Northowram drew level in the second half through veteran Matt Calland but Jack Pullen restored Saints’ lead with a stunning 30-yard volley. Moments before the end Paul Glew levelled to take the tie into extra time. Bradley Madin’s fine header looked to have won it for Saints with five minutes left but Glew who popped up again following a long throw and Rams won the shoot-out. Two goals from Gav Martin helped Calder ‘76 Reserves beat visitors Greetland Reserves 3-1 while Denholme United Reserves beat their visiting Henden Royd Red Star counterparts 3-2. Midgley United Reserves got off the mark for the season with a 3-0 win at Elland Allstars in Division One. Teenage centre forwaerd Jake Shaw capped a man of the match display with two goals and skipper Simon Kavanagh got the other. Mark Kelsey scored four times as Elland United won 9-2 away to Salem. Shelf FC have shot up to second in Division Two after a 3-1 home win over Sowerby United Reserves, Tony Aaron scoring twice.